Kangra is the most visited place in Himachal as It has many tourist attractions. Kangra district derives its name from Kangra town that was known as Nagarkot in ancient times. Kangra proper originally was a part of the ancient Trigarta (Jullundur), which comprises of the area lying between the river “Shatadroo” (probably Sutlej) and Ravi. A tract of land to the east of Sutlej that probably is the area of Sirhind in Punjab also formed a part of Trigrata. Trigrata had two provinces. One in the plains with headquarters at Jullundur and other in the hills with headquarters at Nagarkot (the present Kangra). This trek is 40 km by car from Dharamshala, from the village there’s a trek of approximately 13 km to reach the lake, the trail is really beautiful. It is of a moderate difficulty level. Dal Lake is a small mid-altitude lake (1,775 m above sea level) near the village of Tota Rani in Kangra district (Himachal Pradesh) in northern India. The name ‘Dal Lake’ is taken from Kashmir’s Dal Lake. The lake is surrounded by deodar trees and is considered to be a sacred spot as there is small Shiva mandir (shrine) on its bank. There are different kinds of fish that live in this lake. The lake has greenish water. Dharamkot is a little village in the Dharamshala. It’s the famous Buddhist destinations in Himachal Pradesh, India. 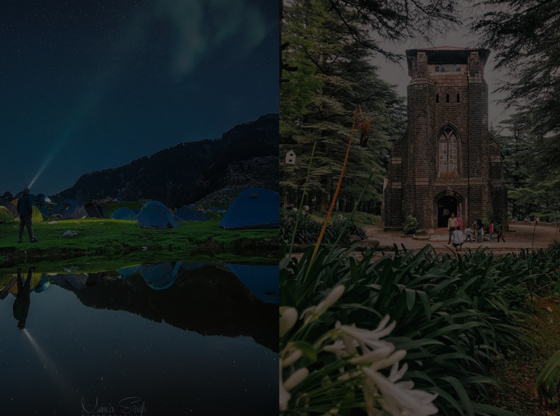 While Dharamshala and McLeodganj have become extremely crowded because they are popular summer travel destinations, fortunately, Dharamkot has managed to maintain its quaint charm. This little Yoga village is ideal for a few days’ time off from the real world. One of the most popular and most visited treks is Triund. If you visit you must trek to Triund the enjoy the beauty of the hilltop. Triund provides you a rest from the life of city but to you need to be fit enough to enjoy the trek. Once you reach the hilltop you will be greeted by the weather, whether its open or a close day, you are going to enjoy both. These days Triund is closed(July -August-Sept) for night stays. If you don’t wish to trek long, you can choose local nearby places to visit, McLeodganj itself offers you variety of sights like St. John Church, Bhagsu Nag Temple, Bhagsu Nag Fall and His Holiness Dalai Lama Main Temple. All places are adjoining each other and can be covered within one day walking. Kangra Fort is 20 kilometers from Dharamshala and one of the beautiful place to visit in Kangra. The fort has a beautiful history. If you visit here, go inside with an audio guide which you get near the entrance! The fort has a beautiful history which is not taught in our syllabus. Kangra is called as Tea Capital of Northern India and is famous all across the country for its vast spreads of tea gardens, which are the chief attraction of the town. The tea gardens of Palampur are the perfect place to witness the vast tea gardens and the tea making process in great detail.